We design all of our patterns and fit for a variety of body types. Read about our styles here to find the best style for you. All aprons are completely reversible with the contrasting fabric that you see in the pockets as the main fabric on the reverse side. If you would like to order an apron please e-mail us at ragamuffininfo@yahoo.com to see what fabrics we currently have available. 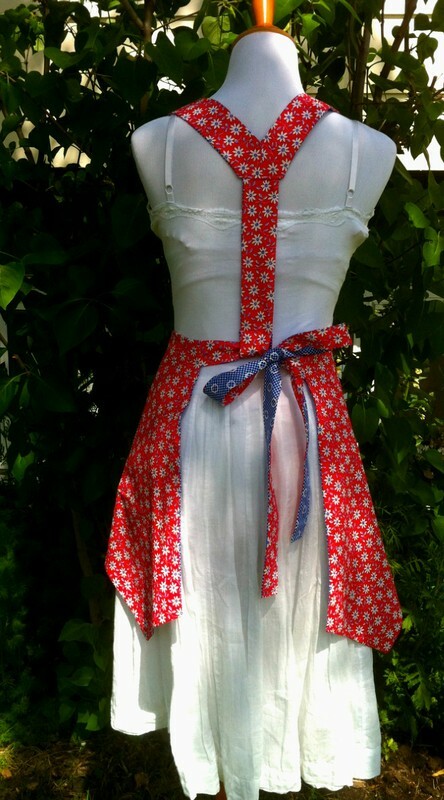 Anne designed the Mitzi for the customers who long for a 50's style apron. With a fuller skirt, handkerchief hemline, contrasting collar, 2 pockets, and Y-back, you'll feel fancy and comfortable at the same time. This style is great for a variety of figures although does not have as much bust coverage as some other styles. It's also a flattering style for women with fuller hips and pear shapes, with the fuller skirt allowing more room. Over the years we've had a few requests for an apron with a ruffle. While looking at some Depression Era aprons Anne was inspired by a simple long apron with a curving ruffle, the trick was to make it reversible. "It took three mock ups and a lot of fit adjustment before I was completely satisfied. The key was to have the ruffle up front by the knees and not adding weight to the hips! It turned out beautifully and is very feminine and flattering to thin girls and curvy figures. It's very easy to get in and out of this apron, which makes it my top pick this year for a wedding present." New Style! Anne was inspired by clothing from the 30's for this apron. "I wanted to design something that showed the ingenuity that Depression Era women had to have to make their clothing stylish. Because money was scarce, they couldn't afford to use yards and yards of fabric so the embellishments had to be subtle. This apron incorporates two small pieces that give the illusion of a capped sleeve. The hemline, neckline, and pockets all have a small cut out that ties the overall look together. Every time I wear this apron around my 90 year old grandpa he perks right up and tells me how much he loves this apron. 'Now that's what an apron should look like!' he says. I think it's the greatest of complements because I know he's seen a lot of aprons in his life." Our most popular apron. The Della is firmly rooted in the 1930's with it's long straight fit. Contrasting hem, pocket, and shoulder inserts show off both fabrics with Y-back collar so the apron sits on your shoulders and does not pull at your neck. 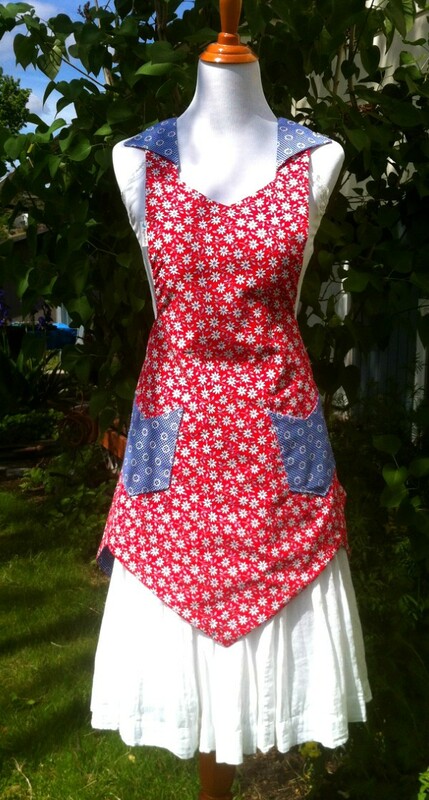 This is Marcia's favorite working apron "because it's so comfortable to wear and it keeps you well covered and clean!" The Della fits a wide variety of figures and is one of our most versatile fits. New style. Anne's 11 year old daughter was watching a movie about kids during the Depression Era and spotted a cute collar on one of the girl's dresses. She said, "Mom, you should design an apron with a collar like that!" So here you go "Dottie Girl" this one's for you. 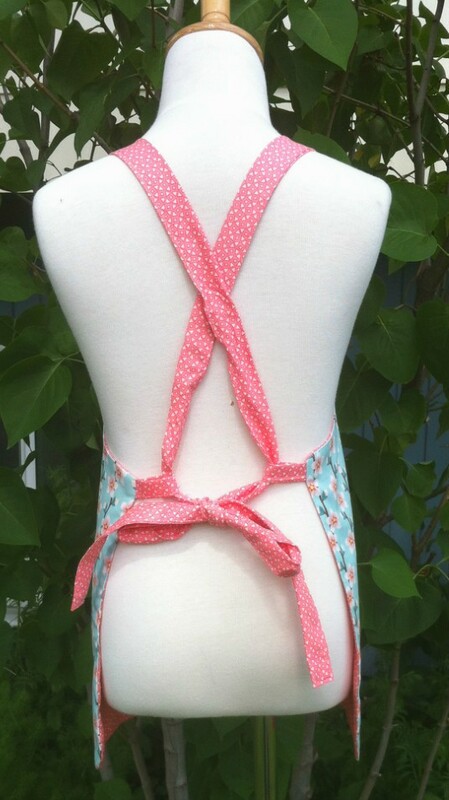 Women with fuller bust-lines and figures will love this apron. It slips right over the head with the collar sitting back on the shoulder line not on the neck. It ties low at the back and holds the apron in place. This is a super easy apron to wear with lots of style. The Gertie is a true working girls apron. Whether you're cooking, cleaning, gardening, or waiting tables you'll love this easy half apron. With three deep pockets, two loops for towels, keys, or utensils, you'll have an easy working apron with some style thrown in. Extra long ties allow you to tie in front or back. For years we had requests for a smock style apron; once we finally designed one it became our second best selling apron. The Hazel pulls right over the head like a t-shirt. It has ties on both sides at the natural waist so you can adjust it to fit your size. There are four deep pockets on either side to store your odds and ends and a half back so you can do both standing and sitting projects without the hassle of sitting on your apron. This apron fits a variety of body types and is great for use inside and outside. We've had many requests for a men's apron over the years. We've even had men buy the Della because they liked the fit so we designed the Ray with the same basic comfortable fit but styled for a man. The Ray is broader through the chest and shoulder area for a man's body, the Y-back keeps the weight of the apron off of the neck, a bigger pocket for a man's sized hand and loop for towel with cut away design to keep the apron from catching on the legs. This apron will fit a wide variety of heights and weights. A smaller version of the Ray for your little man. This apron will fit most 5-10 year olds. Crisscross straps provide a comfortable no pull neck and are adjustable for height and girth. 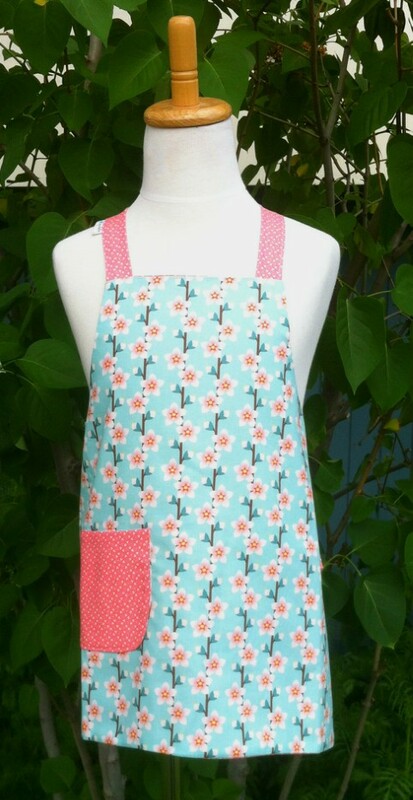 This little reversible apron comes in both girl and boy fabric choices. It will fit most 2-6 year olds. The crisscross back makes it both comfortable and adjustable for height and girth. A kid sized version of the Della. This apron will fit most 6-10 year olds. It is reversible and the crisscross straps make it both comfortable and adjustable for height and girth.